2013 marks the birth of the third generation Santa Fe. 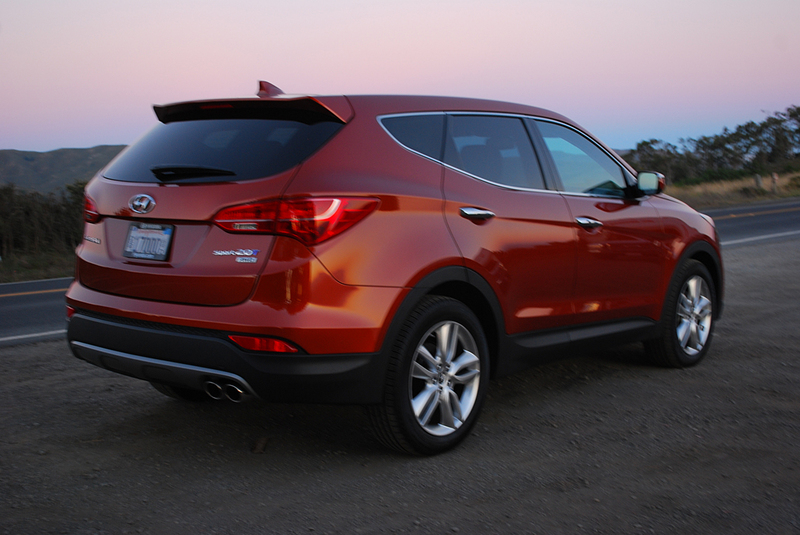 Hyundai has divided the model line into 2 versions, Santa Fe Sport and Santa Fe. The Sport seats 5, while the larger Santa Fe seats 7. Although the Sport may be smaller, it manages to cram a stunning assortment of delicious ingredients into its 106 inch wheelbase while keeping costs affordable. The base model all-wheel-drive (AWD) Sport retails for just $26,200 but still provides 190hp. from a 2.4 liter inline four borrowed from the Hyundai Sonata. Our test Sport, however, improves performance dramatically thanks to its turbocharged 2.0 liter inline four, which makes 264hp and 269 lb.-ft. of torque. This combo sells for a reasonable $29,450, and even returns 21 MPG overall. When you add ancillary packages like the Leather and Premium Equipment Package ($2,450) and the Technology Package ($2,900), as delivered price rises to $35,925. This still represents a stunning value for an SUV that competes on even terms with a BMW X3 which costs close to $50,000 when optioned like the AWD Santa Fe 2.0T. In keeping with the patina of its namesake New Mexico town, our test Santa Fe Sport was resplendently painted “Canyon Copper,” a brilliant shade you’re not likely to forget. Stomp the accelerator, and the Sport leaps forward with a vengeance you won’t soon forget either. The turbo motor drives a 6-speed automatic gearbox with SHIFTRONIC manual override control. All-wheel-drive chimes in when needed, but can also be manually selected through a default lock. Because peak torque is available at just 1,750rpm, the Sport lunges ahead from a standstill with such vigor you hardly ever need to resort to manual shift control for thrust enhancement. The AWD Sport tackles twisting roads with the kind of aplomb reserved for low flying sports cars. Helping in this regard are “Hyper Silver Alloy” 19 inch wheels supporting beefy 235/55R19 Continental CrossContact tires that provide excellent cornering bite. We ran this Hyundai over 38 miles of twisty California Route 128 from St Helena to Winters and were pleasantly surprised by its comfortable ride, poised handling, and passing power. An especially nice feature is “Driver Selectable Steering Modes” which allows you to choose from 3 settings via a spoke mounted button: Normal, Comfort and Sport. On Rte. 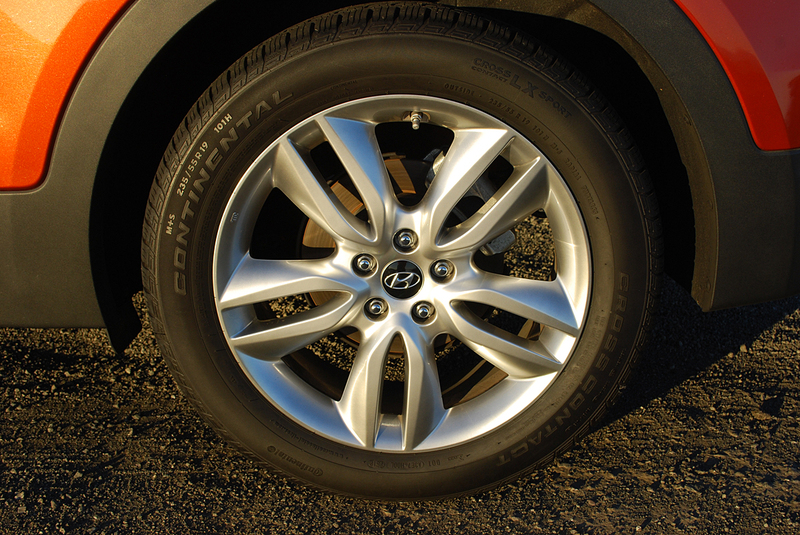 128, we settled on the Sport choice, and found just enough resistance to enhance accurate positioning of the Santa Fe. A less slippery leather grip on the steering wheel would be a welcome change, however. The cabin of the Sport is so spacious and airy that long trips are enjoyable rather than tiring. The “Panoramic Sunroof” which is part of the Technology Package opens up the interior like the twist lid on a sardine can. Even back seat passengers get a dose of fresh air and natural light because this vast roof both slides and tilts. The back seats accommodates 3, and the outside 2 positions get heated seats, which are part of the Premium Package. The spaciousness of the Santa Fe cabin becomes abundantly clear when you drop the rear seats flat to create a vast storage area that will easily accept a mountain bike. 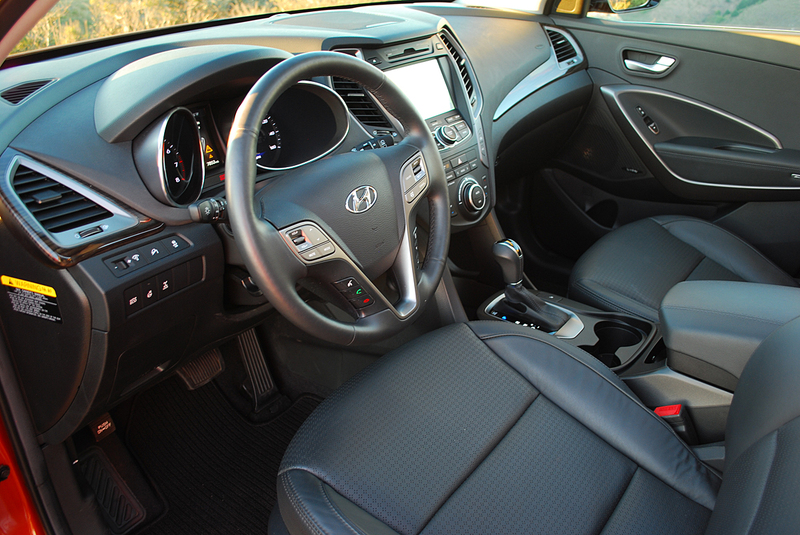 The only shortcoming inside the cabin is Hyundai’s use of multiple vinyl facings for dash, door and console surfaces. The various pebble grains don’t quite match, and the matte black console looks cheap. But mismatched plastic is the only clue that you’re not driving something far more expensive here. 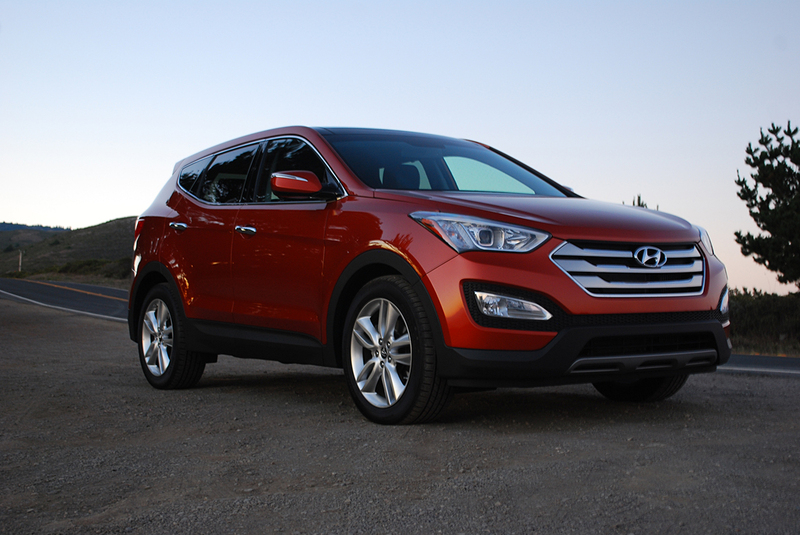 From a cost efficiency standpoint, the Santa Fe Sport is one of the best buys in the SUV market today. For $35,000, you simply cannot do better.